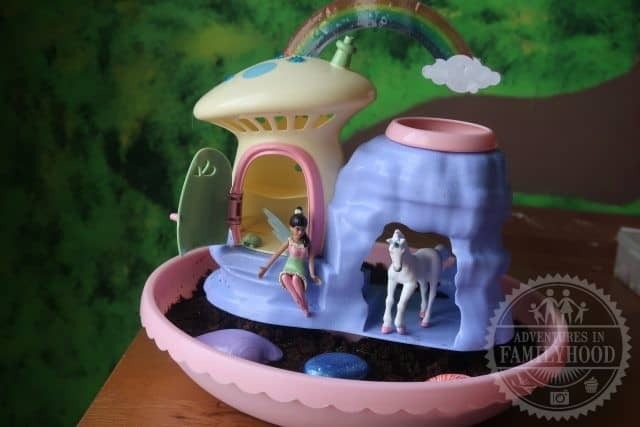 We received a My Fairy Garden Unicorn Paradise for this review. Our opinions are our own. 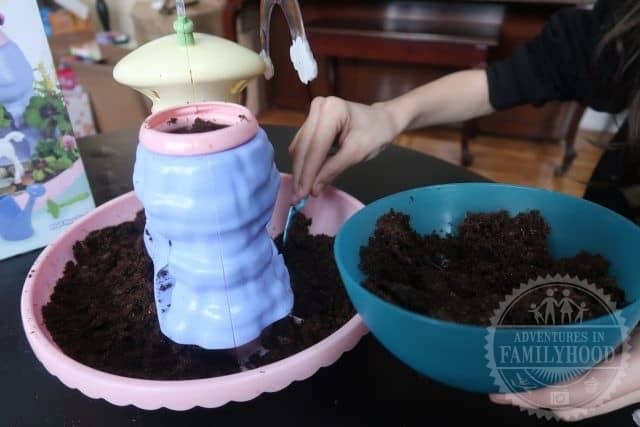 You may not think of gardening as play, but the My Fairy Garden Unicorn Paradise inspires children to play in a magical environment that they create with a little help from Mother Nature. 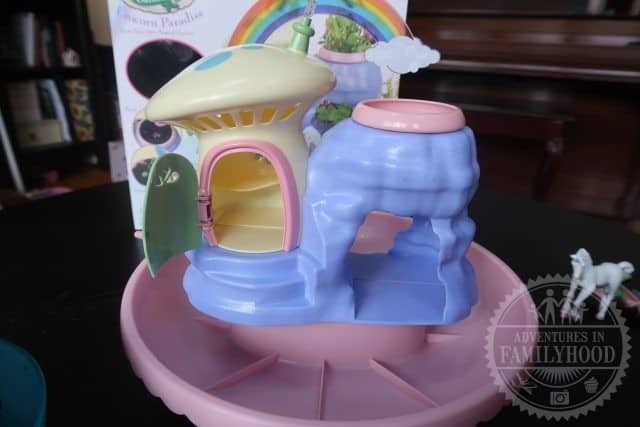 Here is what makes a My Fairy Garden such a unique toy if you are looking for a gift idea for your child. 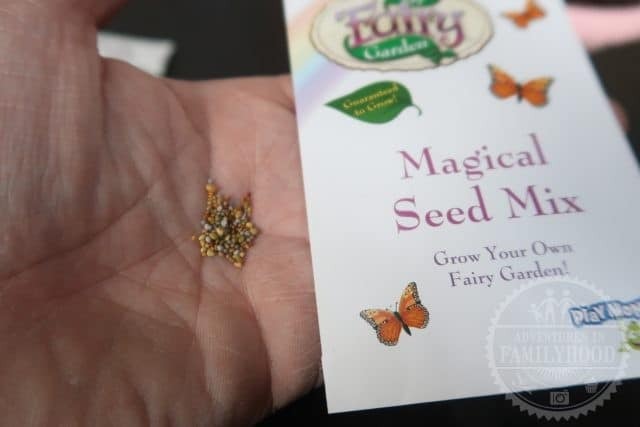 We saw our first My Fairy Garden at Toy Fair NY last February. We immediately thought of it as being perfect for Bella. 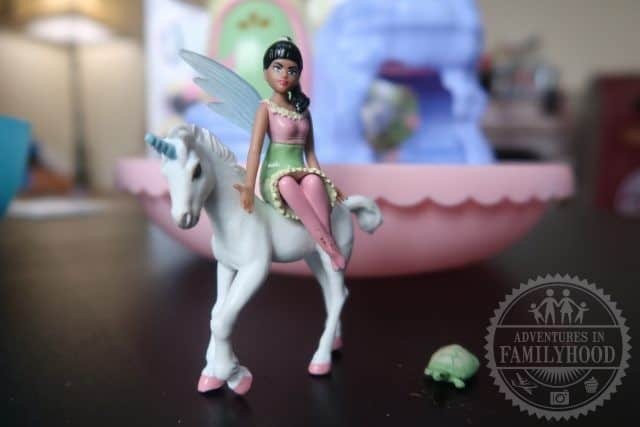 Aside from it obviously fitting into her unicorn obsession, the playsets have incredible detail, seem very well-made, and have the quality of being more than just something to play with. These are so much more than a toy. They are collectibles. They are science experiments. They add beauty to any room. They inspire the imagination. Needless to say, we were thrilled when we got our hands on one to try for ourselves. Assembling the My Fairy Garden Unicorn Paradise was pretty straightforward. Both the blue cave and yellow toadstool house came in two pieces. The halves of the cave and toadstool house snapped together easily. A little trial-and-error was needed to figure out which way the bowl fit into the top of the cave, though. The rainbow sticker was about as easy as you’d expect to apply to the clear plastic rainbow-shaped piece. That piece attached to the back of the toadstool house and shows no sign of falling off. The door to the toadstool house was already attached when we opened the box. It came off once while we were putting it together and it snapped right back into place. 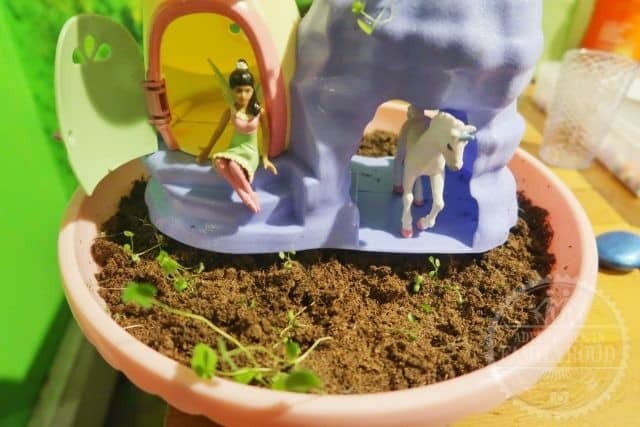 The My Fairy Garden comes with its own soil and seeds. The soil doesn’t look like a lot when you first open the box. It is compressed into two pucks. 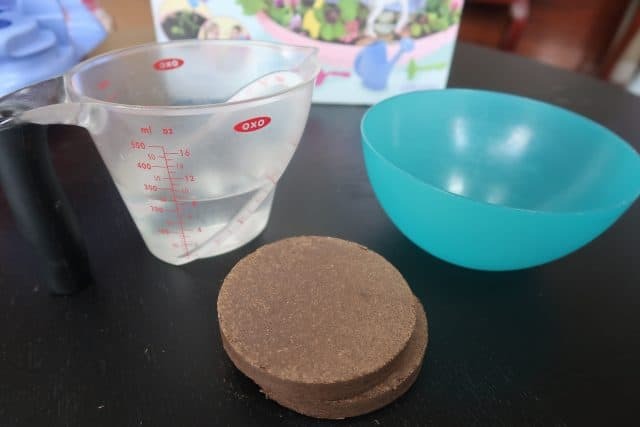 Add some water and give it some time and they expand until you can break them up and fill the garden. I had my doubts as to if we’d have enough soil, but the two pucks were plenty to form a decent layer of soil around the base, and to fill the bowl up on top of the cave. Once everything was ready, it was time to sprinkle the seeds in. 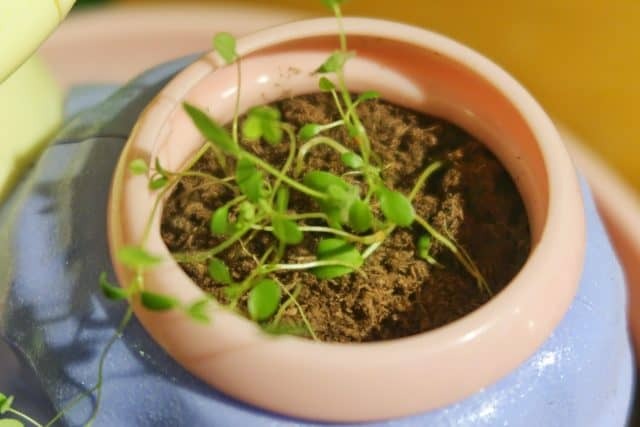 The package of seeds that was included is a clover mix of Crimson Clover Dixie, Purple Prairie Clover, Red Clover, White Dutch Clover, and Yellow Sweet Clover. We took care to spread the seeds out evenly. The instructions stressed the importance of not letting the plants crowd each other. That’s a good reminder for us since we’re not expert gardeners. Then we pushed in the seeds and added a little more water. 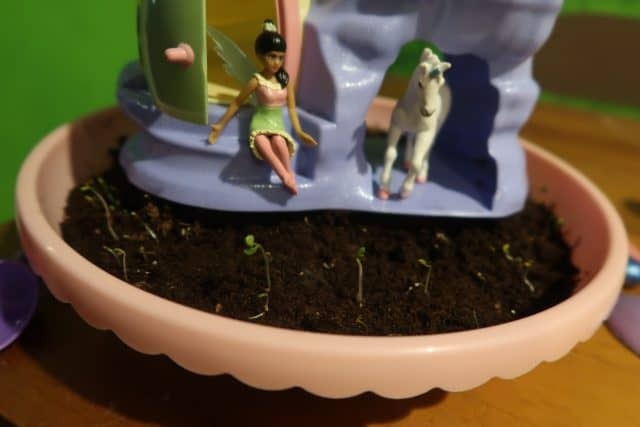 One of the best things about the My Fairy Garden is that there are many ways to add to it. You can mix and match pieces from different sets. Or you can add your own unique touches. 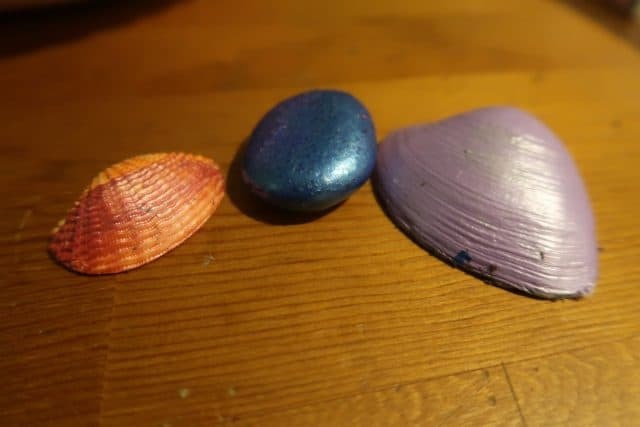 Bella added some painted rocks and seashells to the garden, as well as some sparkly stickers to the toadstool house. We took the rocks and shells out for now so they don’t get in the way of any of the seed growth. 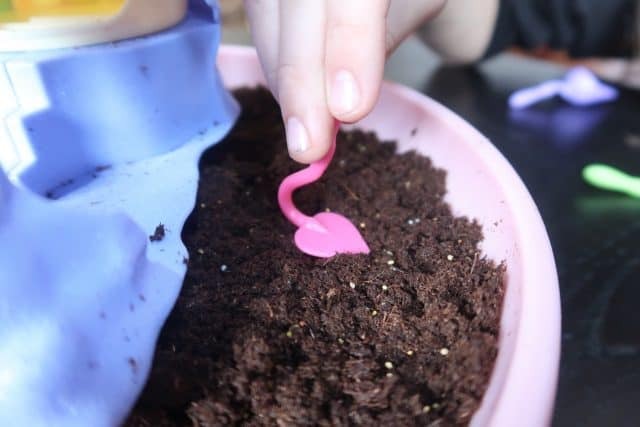 Another way you can put a twist on the My Fairy Garden is to use your own seeds. You can grow anything you want! 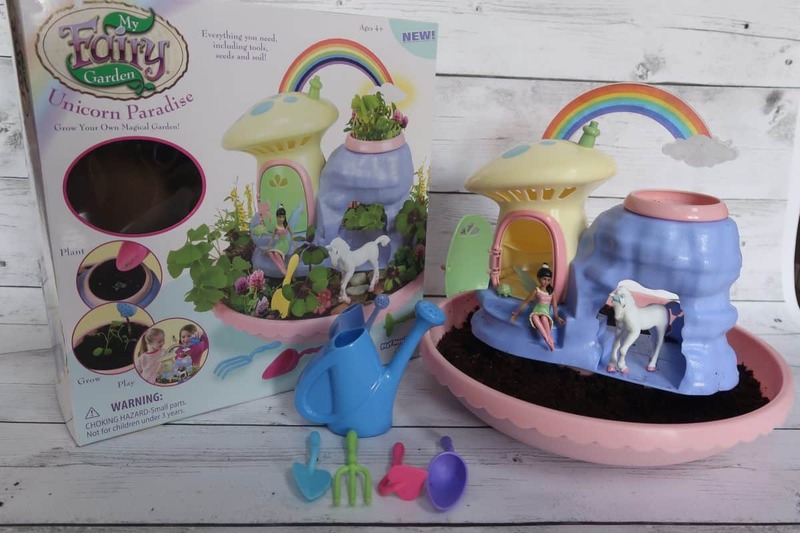 Our My Fairy Garden Unicorn Paradise comes with three figures: Dahlia the Fairy, Celeste the Unicorn, and Pebbles the Turtle. You can pose Dahlia’s head and arms, but she’ll always be in a sitting position. She has a hole in her back where you can attach the included cable to make her “fly” above the garden. With a little work you can get Dahlia to sit on the unicorn or around the garden. 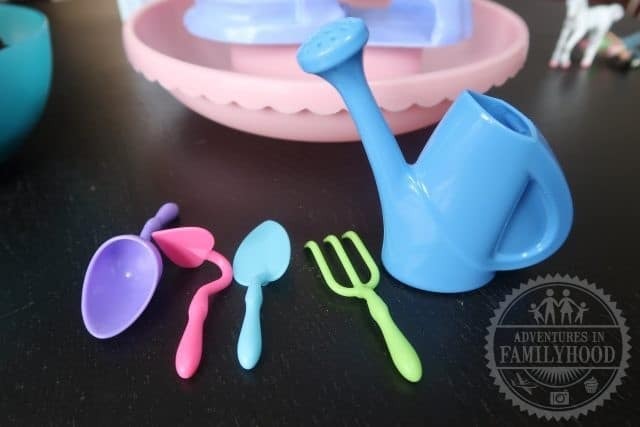 The playset also comes with some tiny tools for tending to your garden and helping it grow. They are big enough to be useful as tools, but small enough to be used in pretend play with the figures. We found a spot that gets plenty of sunlight for our My Fairy Garden. Now the challenge will be to take care of it so it can blossom and grow. If all goes well, we expect to see some sprouts in a week. A fully grown and blooming garden may take up to 10 weeks. 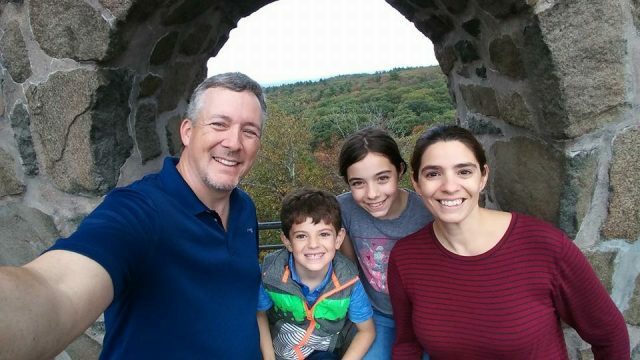 We’ll update this review with our progress weekly. Week 1: We saw our first sprouts coming through just days after we set up the garden. Very exciting! Week 2: more growth! No new sprouts but the ones we’ve seen are growing. Week 3: Plants have gone limp! Soil was very dry and I think we forgot to water it. Week 5: No more mold, but no more growth either. Plants are no longer limp, but I fear this is the best the garden will be. The top seems better than the lower area. Thinking about getting more seeds to try and fill it out. So far, I’d highly recommend a My Fairy Garden as a unique gift idea for the holidays, a birthday, or just because! Like any garden, you’ll have to care for it to make sure it grows well. We’re obviously still learning the ins and outs of that. 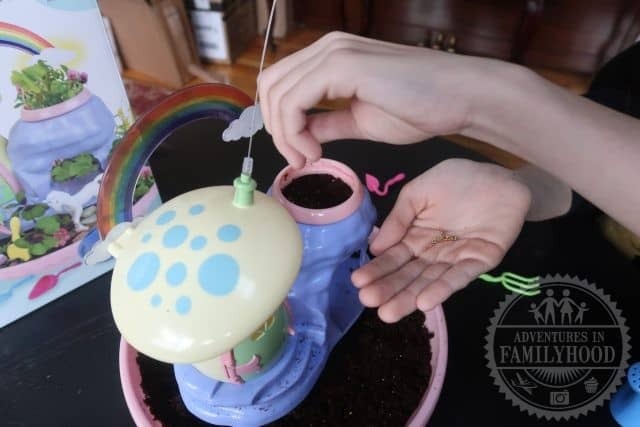 My Fairy Gardens are available from popular retailers like Target, Walmart, and Amazon, as well as directly from Play Monster online. Thank you again to the folks at Play Monster for providing the My Fairy Garden Unicorn Paradise for our review.